The recovery of bald eagles in Georgia shows no sign of slowing. Surveys completed this month by the Department of Natural Resources' Nongame Conservation Section documented 158 occupied nesting territories, 116 successful nests and 190 young fledged. Those preliminary counts are all up from 2011, when the totals were 142 territories, 111 successful nests and 175 eaglets. 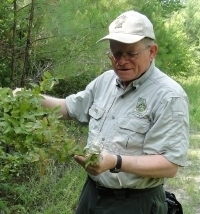 Survey leader and Nongame Program Manager Jim Ozier has tracked the national bird’s rebound in Georgia since the late 1980s. “They’re now in places I never would have thought they’d show up,” Ozier said. Examples this year include an eagle nest at Berry College near Rome and a nest (pictured) on a rural Piedmont Georgia farm far from a major reservoir or river, the usual source of fish, birds and turtles that eagles prey on. Eagle populations in the state are concentrated along the coast and around reservoirs and rivers. One new nest that proved no surprise is at Lake Lanier. Although an eagle nest had not been documented before at the 38,000-acre North Georgia lake, bald eagles have often been seen there. “Really the surprise is that it took us that long to find it,” Ozier said. The number of young eagles observed this year fell just shy of 2010, when 194 eaglets were counted. 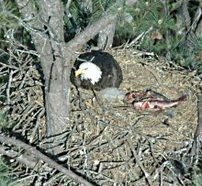 Ozier said warmer than usual weather might have resulted in eagles nesting and raising their young earlier, with some eaglets fledging before the final round of survey flights was taken last month. If you haven’t filed your 2011 state income tax return, please consider contributing $2 or more to the Georgia Wildlife Conservation Fund. The income tax checkoff for wildlife is line 26 on Form 500 or line 10 on Form 500EZ. As little as $2 can benefit for more than 1,000 Georgia plant and animal species considered species of conservation concern. Other ways to help Georgia wildlife. Occupied nesting territories: 158 (preliminary). Counties with an active nest: 53 (49 in 2011). Lead counties: Chatham (17); McIntosh (11); Liberty and Camden (10 each); Lowndes (nine); Decatur (eight); Glynn (six). In Georgia and other states, scientists are studying the impact of Avian Vacuolar Myelinopathy, or AVM, a neurological disease deadly to waterbirds, mainly coots and bald eagles. One suspected link is that coots ingest a strain of cyanobacteria or blue-green algae sometimes found on submerged aquatic plants, particularly hydrilla. A toxin in the algae then sickens eagles that eat contaminated coots. Discovered in Arkansas in 1995, AVM has been documented in Georgia at lakes Clarks Hill, Juliette, Varner and West Point, and some small reservoirs near Atlanta. Clarks Hill, also known as J. Strom Thurmond Reservoir, is a hotspot. Eagle nesting territories on the lake have dwindled from eight to one, Jim Ozier said. Researchers are exploring what can be done to combat AVM. A possible approach is using grass carp or herbicides, or both, to manage against the aquatic vegetation that hosts the apparently toxic algae. (See also "Deadly appetites," November 2010). 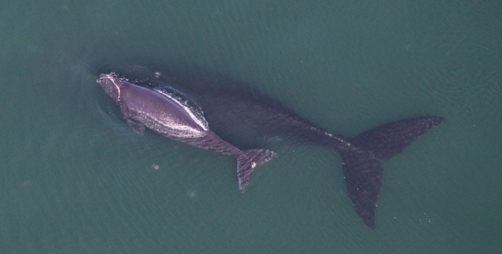 North Atlantic right whales hit a 10-year low in calving this winter, with only six calves documented off the coasts of Georgia, Florida and South Carolina. The annual average over the past decade is about 20 calves, said Nongame Conservation Section biologist Clay George, who heads the Georgia Department of Natural Resources’ work with the endangered whales. One calf spotted this year has since died. The good news: Another calf observed in the Southeast this winter was seen recently alive and well near Provincetown, Mass. Overall sightings for the calving season, which ended last month, were also lower: 61 non-breeding whales spotted compared to 120 in 2010-2011. The numbers beg the question: Why? Leaner food resources in the Bay of Fundy in 2010 may be partly to blame, undercutting the whales’ health and leading two years later to fewer calves. A similar pattern was seen in the late 1990s when 11 calves were born during a three-year period. “Hopefully, this time it’s just a one-year dip,” George said. Possibly as few as 400 North Atlantic right whales exist. The peregrine falcons that nest outside the offices of McKenna Long & Aldridge high on Atlanta's SunTrust Plaza have four eggs that should hatch any day. Another pair that has nested in Midtown for several years is back at that site, and a new nest with eggs has just been confirmed in the Dunwoody area, raising to three the number of known nests of these Atlanta falcons. Biologists hope to soon confirm the nest of a fourth pair in Buckhead. Sea turtle strandings – when a sea turtle is found dead or injured on the beach or strand – peaked at 16 turtles during a recent week. This year’s strandings total is up to 31, more than double the average. DNR Sea Turtle Program Coordinator Mark Dodd said factors include unseasonably warm water temperatures that drew turtles closer to shore where they’re more at risk from boat strikes and hopper dredges used to maintain Savannah River, Brunswick and St. Mary’s shipping channels. The U.S. Army Corps of Engineers limits dredge operations to cooler months to avoid conflicts with sea turtles. DNR rangers homed in on another factor in strandings, conducting a special patrol March 30 to check turtle excluder devices on commercial shrimp trawlers off St. Simons and Jekyll islands. The patrol documented federal violations on one vessel – all four of the trawler’s nets were out of compliance, Ranger 1st Class Craig Smith – and those violations have been turned over to the National Marine Fisheries Service. Smith said officers will continue checking TEDs deep into the summer. Read the weekly Law Enforcement Section reports. In the final days of the Georgia General Assembly, the House sunk a bill that would have allowed the harvest of “deadhead logs” in the Altamaha, Flint, Ocmulgee and Oconee rivers. The 67-93 vote on Senate Bill 362 reflected concerns that removing the 100-year-old logs would impact wildlife habitat. Georgia Project WILD now offers an e-newsletter! Receive the latest information on workshops and materials for this environmental program for students, as well as updates on related programs such as Growing Up WILD. Adult leatherback sea turtles, Dermochelys coriacea, are the largest turtles in the world, weighing 660-1,210 pounds. Federally listed as endangered, leatherbacks are found globally, and are possibly more widely distributed than any other reptile. These sea turtles are found migrating along Georgia’s coast in the fall and spring, and commonly seen foraging on sea jellies here during winter. 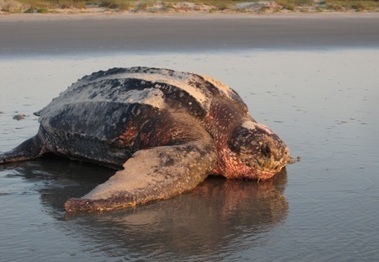 Although leatherbacks regularly nest in the Southeast, particularly in Florida, only a handful of nests – 11 in 2011 – are documented each year in Georgia. Learn more about this rare species (pdf) and others in our state.